Lately, there have been a growing number of stories about the double-dip recession in light of bleak economic reports on factory orders and consumer confidence. Pretty soon so many people are fostering these myths that they become easy to believe. 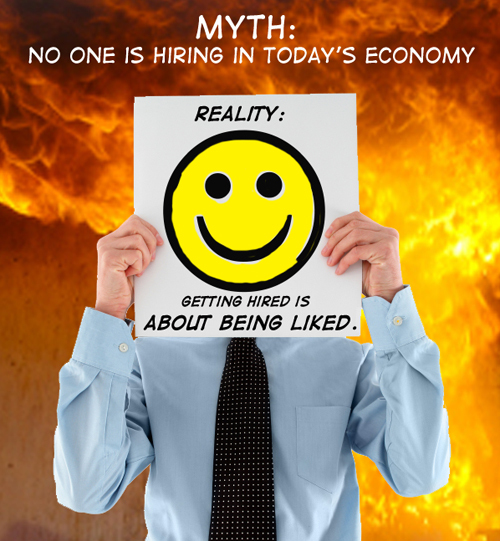 Job seeking is about the individual and being liked. Job seeking is not about how a specific industry or company is or is not performing. It does not even matter if the company is hiring. If you present the right attributes and are well liked by the interviewer, the company will create a position for you. A company announcing job cuts or in bankruptcy should be avoided since they are not hiring. Companies in turmoil are not only hiring but many are willing to pay a good salary to top-tier candidates. Contrary to what most job seekers may believe, the company that is having difficulties, even announcing sizable layoffs, has a more urgent need for qualified people than many economically fit companies. Not only do most other job seekers avoid these situations, thus reducing the competition, but such companies may be willing to pay a premium to those who can prove they have what it takes to revive the business. Disregard the myth that adverse reports about a company mean that there are no job possibilities at that company. The fact is, someone has to run the business, and large-scale layoffs will frequently involve realignments and restructurings which can create new job opportunities. What constitutes a company in turmoil? Look for layoff announcements, firing of the president, multiple senior level job changes, closing of facilities, rapid decline of the stock price, cutting of dividends, and negative broadcast or printed stories. Companies today are not interested in hiring candidates over 55 years old. Older workers are highly regarded for several reasons. For one, employers see them as valuable assets in the struggling economy because their experience and skills make them better able to do the work of two and sometimes three younger, less seasoned workers. More importantly, companies are looking ahead — not just to a recovery sometime this year or next, but 5 to 10 years down the road when a labor force depleted by retirements will not be able to fill the jobs our economy is projected to create. As a result, it will become more and more important for companies to find ways to keep older workers from retiring. According to the Bureau of Labor, the projected number of jobs to be filled (167.8 million) will outnumber available workers (157.7 million) by 10 million over the next decade. If you have spent your entire career in one industry, it will be impossible to find a position in another industry. In reality, quite the opposite is true. Companies are most concerned with a candidate’s core skills and how they can be applied in their industry. An employer may, in fact, be seeking people from outside its industry in order to gain new perspective and new ways to approach old problems. We encourage job seekers to consider many different industries because casting the widest net possible will greatly improve one’s chance of success. Job seekers should realize that they can take their base skills, whether it is in accounting, information technology, project management or marketing, and apply them to any number of industries. There is no reason a marketing manager for a manufacturer of brake parts cannot shift his or her skills to become a marketing manager for an agricultural company or a hospital, two areas which are hiring right now. Unless a company is advertising open positions in the newspaper or on the Internet, then do not bother contacting anyone there about a job. A very small percentage of jobs are actually found through newspaper or Internet ads because a very small percentage of the available jobs are listed there. Job seekers should be focused on ways to create opportunities by actually getting out and meeting people and visiting prospective employers. It is a system that results in a lot more face-to-face rejection, but in the end a job is usually found much faster. One technique that has proven successful is simply showing up at the office of a prospective employer, without an appointment, and waiting to see the manager you want to work for (do not go to the human resource department unless seeking a position in that area). Even if the company is not officially hiring, several positive scenarios could result: there is an opening the company was going to fill internally, but will now consider you as a candidate; there are no openings, but the manager liked you so much that he or she will create a position for you’ or the manager has no jobs to offer, but knows other companies that are hiring and will recommend you for consideration. Follow up calls are annoying; if the company is interested they will call you. Follow up is essential in the job search process. The manager with whom you interviewed has at least a dozen other responsibilities on his or her plate. A follow up call and/or letter should not only remind that person that you spoke but also what separates you from other candidates. Follow up also demonstrates your interest and enthusiasm about working for that employer. Such a small percentage of people actually follow up these days, that the candidates who do really distinguish themselves from the rest of the pool. Because of the economy, it is likely that you will have to accept a salary lower than what you earned in your previous position. If an employer goes to the expense, time and effort to find a qualified candidate, it wants that person to stay. A candidate may accept a salary lower than his or her previous salary, but chances are that individual will continue job searching after being hired and leave as soon as a better offer comes along. That being said, in a competitive job market, the burden of proving that you are worth the higher salary is much greater. The face-to-face interview, even in the Internet Age, is still the key to job search success and the ability to garner a higher salary. Candidates must be able to provide supportable evidence of their achievements for other employers and explain how their experience will be valuable to the new situation. In this economy, companies are looking for individuals who can save money and/or make more money. So, if candidates can point to specific ideas, plans, or actions they developed which contributed to significant cost-savings for their former employer, that is going to be well-received by any employer.